Republican Gov. Rick Perry leads his Democratic challenger, Bill White by 10 points — 50 percent to 40 percent — in the latest University of Texas/Texas Tribune poll. Libertarian Kathie Glass has the support of 8 percent of respondents; Deb Shafto of the Green Party gets 2 percent. 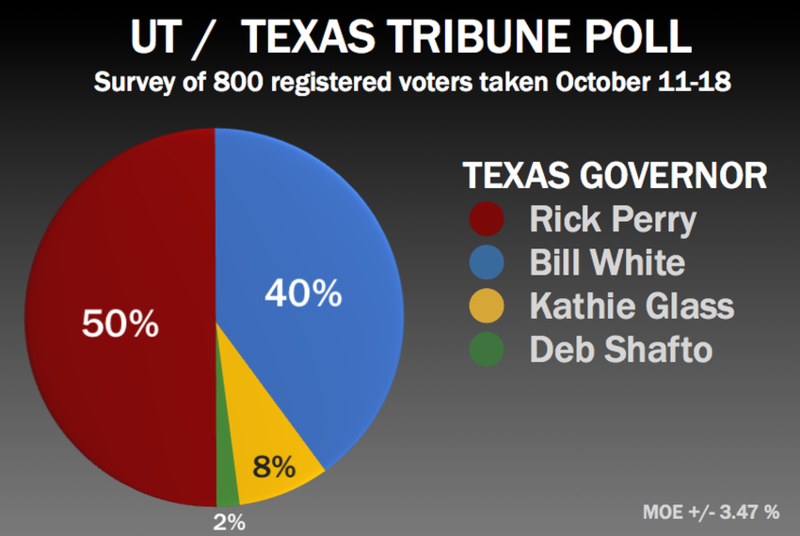 In the last UT/TT poll, conducted in early September, Perry led by 6 points, 39 percent to 33 percent. In a red state in a red year, GOP incumbents in other statewide races are beating their Democratic opponents by between 13 points and 20 points, the new poll found. In the last UT/TT poll, conducted in early September, Perry led by 6 points, 39 percent to 33 percent. That poll also found 22 percent undecided; in this poll, undecided voters were pressed to say which candidate they would choose if the election were held today. Though Perry has more voters on his side, White's voters are more likely to say they strongly support their candidate. While 72 percent of White's voters support him "very strongly," only 53 percent of Perry's voters say the same. Glass has very strong support from 40 percent. All of Shafto's voters say they only "somewhat strongly" support her. "As the electorate begins to pay more attention, the numbers at the top of the ticket and in the down-ballot races suggest a predictable pattern of partisan alignment, in which the trends of Republican identification we've seen in the last few decades are being amplified by a broader national political environment favorable to Republican candidates," says Jim Henson, a government professor at UT who oversees the UT/TT poll with his colleague Daron Shaw. Republicans also lead in generic contests for Congress and the Legislature. Asked whether they'd vote for an unnamed Democrat or an unnamed Republican for Congress, 51 percent chose the Republican, 33 percent chose the Democrat, 8 percent chose "neither" and 8 percent didn't choose. The same question on legislators got similar results: 48 percent for the Republican, 33 percent for Democrat, 8 percent for “neither” and 10 percent didn’t choose. Barack Obama remains very unpopular in Texas, with only 35 percent saying they approve of the job he’s done as president and 59 percent registering disapproval. The extremes look even worse for the president, with only 14 percent strongly approving and 53 percent strongly disapproving. "For whatever reason, Obama seems to be Velcro and Perry seems to be Teflon," Shaw says. "Voter discontent in Texas appears to be hurting the Democrats despite the Republican monopoly on statewide offices. It's the federal government that Texans are focusing on." As nearly everyone paying attention to the governor’s race knows, the top candidates couldn't reach an agreement to debate. Voters apparently wanted them to. Most Texans we polled — 65 percent — say gubernatorial debates are an important part of the political process, though only 43 percent say they’d watch a whole debate (another 37 percent would either watch highlights or pay attention to media coverage of a debate), and only 27 percent say televised debates have had a big impact on their voting decisions in previous elections for governor. Just 19 percent say gubernatorial debates aren't an important part of the political process; 25 percent say past debates had no impact on how they voted in past races. Respondents to the poll say White has run a more negative race than Perry has. They're about tied on whether Perry's campaign has been more positive (43 percent) than negative (45 percent). But only 35 percent say White's campaign has been positive, while 51 percent say it's been negative. Many of the commercials that have aired on White’s behalf weren't his own but were run by either the Back to Basics PAC (financed largely by Houston attorney Steve Mostyn) or by the Democratic Governors Association. Voters didn't fall for it, apparently, blaming White for the attacks on Perry. Fox News is popular with Perry's supporters, the poll found: 69 percent of Texans who say Fox is a staple of their news diet are backing him. For White's supporters, not so much: He's backed by 70 percent of those who say Fox isn't one of the channels they watch for news. The numbers flip when the channels change: 27 percent of respondents who say they’re CNN viewers are for Perry, while 64 percent are for White; 70 percent of MSNBC viewers are with White, while Perry's the favorite of 25 percent. Talk radio? That's Perry Land, with the governor supported by a whopping 76 percent of those who call themselves regular listeners versus 14 percent for White. By contrast, regular viewers of The Daily Show and Saturday Night Live overwhelmingly favor White (70 percent) over Perry (14 percent). Most voters, 68 percent, say candidates' views on the issues are the thing that most impacts their choice, followed by personal qualities (12 percent), party affiliation (9 percent) and professional backgrounds (6 percent). While Texans are leaning at the moment toward the candidate who's been in public office since the mid-1980s, they say they prefer experience in the private sector (56 percent) to experience in elected office (22 percent) when shopping for governors and other statewide officials. Voters who think public-sector experience is more important than private sector experience favor White over Perry 61 percent to 35 percent. Voters who prefer private sector experience favor Perry over White 63 percent to 26 percent. This is the fifth UT/TT poll (the others are here, here, here and here). The survey of 797 voters was taken Oct. 12-18 and has a margin of error of +/- 3.47 percent.